Blizzard's already been making changes to Overwatch characters, and now they've got their eye on Zenyatta. Unless you've been living under a rock, you pretty much know about Overwatch. Blizzard's shooter has taken the gaming world by storm, and they've been working on not only releasing competitive mode, but also on making sure the game stays balanced. We've already seen a patch that dropped a nerf on McCree and toned Widowmaker down a bit, as well as a console patch that dialed back Torbjorn, and now Blizzard is turning it eye on one of the game's less-played heroes: zen robot Zenyatta. "We've been talking about him. We wanted to see how the Widowmaker and McCree balance changes played out before making any changes. We're exploring some options right now. Nothing more to report at this time." It's not surprising to anyone who's been playing the recently-launched competitive mode that Zenyatta could be in line for some changes, because you almost never see anyone playing him. There's no word on what changes might be forthcoming to improve the character, but it's nice to know that Blizzard is aware that changes are needed. 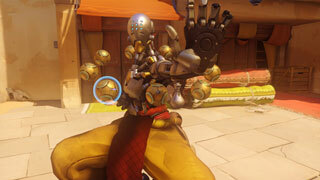 Got an idea how they could make Zenyatta more appealing? Tell us what it is in the forums!